I had run this trail a few times and walked the West Loop once a few years ago. I remember that in the fall there were a lot of leaves and that the trail was mostly flat. Still when hiking 10 miles (plus), is a good workout. Directions: From Interstate 40, take Exit 182 - Hwy. 96. Go west (or to the north of the interstate) on Hwy. 96. Hwy. 96 will dead end into Hwy. 70. Go right or east on Hwy. 70. The Park Entrance will be on the right after about 3 miles. The main road through the Park is the Jackson Hill Road. On Jackson Hill Rd stop at the Visitors Center/Ranger Station, (on the right) for information and permits. If staying overnight a permit is required, but they are free. Continue on Jackson Hill for .3 miles then turn or veer right on Group Camp 1 Road toward the campground. At .5 miles continue straight as the road to the right leads to the Cumberland Presbyterian Church and historic area. Pass a Ranger’s residence and at .6 miles, turn left to the parking area. All junctions are clearly signed. Trail Sign at Maintenance Compound - All Arrows to the Right! There are no restrooms or water available at the trailhead. However the Ranger Station, campground, and some picnic areas have water and restrooms. The sign in the parking lot indicates the trail only goes to the right (west), but the trail is a loop - either direction returns to the parking area. Just to be different, why not go left. Going left from the parking area, walk toward Hall Creek which runs along beside the Maintenance compound. 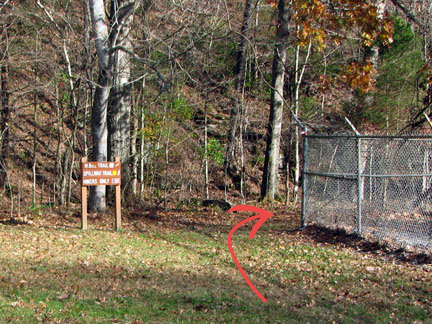 A sign points to the trail on the creek side of the parking area. Upstream the Spillway Trail leads to the dam. The Montgomery Bell Trail follows the Spillway Trail for a few hundred feet then the trails separate. After crossing the creek the MB Trail continues uphill to a ridge top. Heading north along the ridge the trail drops steeply into a gully and then climbs back out to cross Jackson Hill Rd. A sign indicates where the trail continues on the other side of the road. Another sign also indicates the start of an orienteering course. From the road the Creech Hollow Trail enters from the right after .10 miles. The Creech Hollow Trail is the path used to half the MB Trail. It is used by the East Loop and West Loop trails. Continuing the trail follows the ridge for .30 miles until it reaches a set of steps that descends into an old iron ore pit. At the bottom of the steps the MB Trail joins the blue blazed Wildcat Trail. Going right the trail crosses a creek and then Hotel Rd. On the other side of the road is a picnic/playground. The road to the right goes into a picnic ground. The road the arrow points to is closed to vehicles. The MB Trail crosses the road and then goes left back down the hill and continues to the right on the old barricaded road as it crosses a creek. 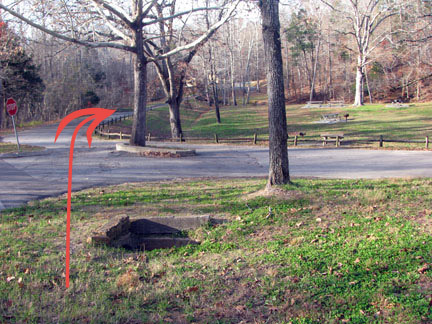 The Old Visitors Center, the car just entered the Park on Jackson Hill Road. The picture was taken close to the large trail sign. The trail leaves the Old Wagon Road. Back in the woods the trail follows an old wagon road until on top of the hill in .75 miles. Staying on top for a third of a mile the trail then begins a descent of .40 miles. The trail crosses a couple of intermittent streams then crosses Wildcat Creek. The shelter is up and to the right. From the Maintenance Parking, it is a total of 2.75 miles to Wildcat Shelter. and is closed to vehicles. Leaving the shelter the trail follows the banks of the stream crossing back and forth a few times. After .5 miles the trail leaves the stream and climbs out of the gully. The trail follows the property line of the park until it joins an unimproved park road. The trail follows the road to the left for a few hundred feet and then turns right on another unimproved road. Both turns are signed. It is a total of a half a mile from the creek. Turn off the road onto the trail. The road was over a mile long. The dirt road follows the edge of the golf course. With a few rolling hills it is 1.05 miles until the trail leaves the road. The turn is signed. Major trail sign at Creech Hollow Junction. Crossing Jackson Hill Road, again. Going left at the junction the trail climbs out of the hollow and reaches the Jackson Hill Road in .35 miles. Junction with the spur trail leading to the Shelter. Crossing the road the trail gradually descends for .30 miles to a junction. The Woodland Shelter Spur goes left. It is a wandering .30 miles to the shelter. From the junction the trail crosses one creek and then a half of a mile to another creek as it slowly continues to a point on Lake Woodhaven a total of .90 miles away. The trail continues along the banks of the lake as it passes a beaver dam and then comes to a boardwalk (in a quarter of a mile) built out into the wet land for viewing. Looking back at Hall Shelter. Continuing the trail begins climbing and reaches Hall Spring and Shelter in .20 miles. Intersection with Hall Cemetery Road. The trail leaves the shelter, crosses a creek, and ascends to the western edge of the Park. At .35 miles a gate is bypassed as the trail intersects Hall Cemetery Road. A long bridge crossing a creek. Crossing the road head north following an old road close to houses just outside the Park's boundary. At .40 miles, cross a creek on a long bridge. Day Shelter at the junction with an old road. From the creek continue heading north for .20 miles. A day shelter was constructed near a trail junction. The old crossing road goes to Group Group Camp 1. The trail begins to descend Jackson Hollow on an old road. Following Jackson Creek the trail crosses the creek on a bridge in .75 miles near the McAdow Cabin. The Ore Pit Loop Trail (red blaze) joins the MB Trail from the right. The MB Trail and Ore Pit Trail are together for the next mile. After looking at the cabin and old church, the trail follows next to the creek heading upstream for a couple hundred feet before a sign. Enter the Ore Pits and climb steadily to the top of the mounds. After a third of a mile the trail tops the hill. The trail then meanders along the tops of the pits. The winding trail is picturesque. A day shelter at the picnic area. At .30 miles is another day shelter. The trail joins the Wildcat Trail (blue blaze) and descends to the road. Crossing the road is a picnic area and shelter. Water is available from a spigot. Crossing behind a picnic table the trail crosses the creek on a bridge and climbs out of the drainage. In .25 miles the trail crosses Group Camp 1 Road. Continuing for a few turns and a tenth of a mile the trail returns to the Maintenance Trailhead 10.35 miles later! To do either the East Loop or West Loop, use the Creech Hollow Trail. This trail bisects the MB Trail. It is 1.75 miles back to the Maintenance Parking. Creech Hollow Lake, fishermen road coming down from the left. From the South junction located 5.35 miles from the trailhead. Head North on the Creech Hollow Trail. Follow along the southern shore of Creech Hollow Lake. It is about a half of a mile to the dam. Just before reaching the dam the trail goes through a grassy field. An old road, primarily used by fishermen, comes in from the left. Cross the road and continue to the dam, contouring above the lake. This section can be difficult to follow if the path or swath through the field has not been mowed. Just past the dam the trail reenters the woods at .55 miles from the starting junction. if the grass has not been cut. Leaving the dam the trail goes across the hollow as it slowly descends to the creek bed. This is a great section of the trail. After .15 miles the trail begins to climb back to a ridge. The trail ends at the MB Trail 1.15 miles from the junction. Trail re-entering the woods, just past the dam. From the northern junction, turn left to go to the Maintenance Parking Area, .60 miles away. At mile 6.00 the Woodland Shelter Spur Trail leaves the MB Trail. From the junction the spur wanders east, then south, and finally west - making a backward C. A creek is crossed at a little over half the distance to the shelter. The total distance from the junction to the shelter is .30 miles.